Sport at Dulwich College (Singapore) is very important and has a high priority. Whether participating for the numerous teams and squads or just taking part in activities to promote a healthy lifestyle, there are options available for all. Every student throughout the College from Toddlers to Year 12 has to take part in sport through the well-structured House events and this helps to encourage a life-long interest in sport. For those that wish to take part in competitive fixtures, all of the Dulwich College (Singapore) fixtures and results can be found on the sports fixtures page. Here you will find all information regarding fixtures and results from the Dulwich College (Singapore) sports community. The numerous squads and sports available allow all students the opportunity to take part at their own level. Students are nurtured and encouraged by specialists in all areas allowing them to flourish and participate without fear. We are proud of the sports performance of all our students. We encourage and celebrate our values of Determination, Courage, Skill and above all a Gracious attitude at all times. It is really important that students learn to compete in the right manner, learning how to win and lose with dignity. We welcome the support of our parents and wider community and are so grateful that this is always done in such a positive manner, celebrating opponents and our students' performances. By working together, we provide an environment for our young student athletes to enjoy sport and healthy living in a non-threatening, fear-free environment, flourishing to become the very best they can be in their own time at their own pace. Those with exceptional promise can progress onto our Student Athlete Support Programme (SASP). This provides a bespoke environment of support in all areas of their lives to develop and fulfil potential both as athletes and academics through the Senior School, helping to provide pathways for life beyond Dulwich College (Singapore). Please look through the various sections to see what opportunities are available for each school. If you have questions regarding the sports programme at Dulwich College (Singapore) please contact us at sport@dulwich-singapore.edu.sg. The core aim for sport in DUCKS is for the children to have fun and to enjoy the first experiences of what we hope will be a lifelong passion. 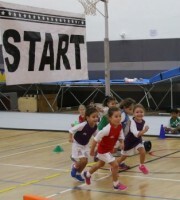 The basic fundamental movement principles are nurtured in a fun, safe, vibrant and supportive environment. Early Years children are taught a variety of sport skills by specialists, focusing on gymnastic and athletic movements, swimming and the development of a range of competitive team and individual sports, based on English independent schools. They are encouraged and nurtured, and their participation is celebrated. The formative years are crucial in the development of our young athletes. As students move into the Junior School the opportunities for structured sports clubs and fixtures are at the heart of the programme. Every student participates competitively in well structured House competitions. Children who want to play for Dulwich College (Singapore) have the opportunity to do so, learning the valuable skills of winning and losing with grace and humility. Open access for sport ensures we provide both depth and breadth to the programme. Students demonstrate the Dulwich traits of Determination, Courage, Skillfulness and a Graciousness every day. The British independent school sports (rugby, netball, football, athletics and swimming) dominate, but a whole range of sports are accessible through the curriculum and co-curricular opportunities. Students also start to experience overseas tours and festivals, with the Dulwich Primary Games a particular highlight for students. The Senior School allows students to focus on their preferred sports and learn how to train to compete. As we foster that lifelong love for sport and healthy living, the focus is on the process of performance, enabling students to participate not with fear, but with self-belief, purpose and pride. For the most talented there is a Student Athlete Support Programme designed to provide pathways for a career or future in sport by nurturing talent through four pillars of individual development: Technical and Tactical in a chosen sport, Lifestyle Management, Physical Strength and Conditioning and Cognitive and Emotional Control. For everybody, participation is celebrated through House sport and competitive fixtures against other schools both in Singapore and across Asia, with the Dulwich Olympiad being a major festival and highlight. The DUCKS Duathlon event encouraged children to participate in a range of disciplines, cheer on their friends and have fun. Parents were thrilled to see their children enjoy winning points for their houses and the warm interaction.